OWL manufactures a complete line of fiber optic test equipment for a wide range of applications, including telco, WAN, MAN, LAN, SAN, CATV, IT, manufacturing, and laboratory. OWL's complete line of fiber optic testers have capabilities ranging from simple optical power and optical loss measurement to complete standards-based fiber optic link certification for both multimode and singlemode fibers, including 10-Gigabit Ethernet! Product lines include: optical time domain reflectometers (OTDR), optical power meters, light sources, talk sets, optical length testers, visual fault locators and serial plastic fiber transceivers. 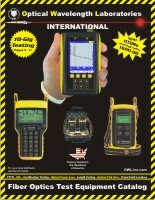 All OWL optical power meters and light sources are NIST traceable. For more information or for assistance in choosing the right fiber optic test equipment for your needs, send us an information request and we would be happy to assist you.